Together with a revolving chair and a Windsor couch, this table was one of three essential components that comprised the novel reading and writing arrangement in Jefferson's Cabinet. 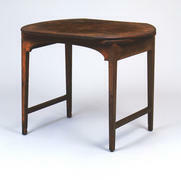 The table was substantially altered in the Monticello joinery, and probably was made there as well. Dimensions 29 x 37 x 29 5/8 in.